From Africa to India to clams and Robert Louis Stevenson! World music artist Daria Marmaluk-Hajioannou spent her teenage years in rural Peru and she has recorded some of her favorite songs from that region, featuring children’s and carnival songs and one of the best-known ditties from the Andes Mountains: "El Condor Pasa". 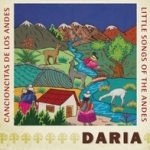 Daria, Cancioncitas De Los Andes / Little Songs Of The Andes. Digital CD, 2013; A Child's Life in The Andes. Companion Book, 2013. 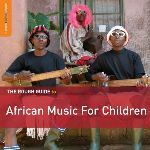 African Music for Children: This is another addition to the Rough Guide catalogue of samplers of music for children. For this album, 13 songs from artists from the African continent have been picked - songs which according to the booklet are children's songs predominently written by parents, "opening a window into these mothers' and fathers' hopes, fears and dreams for their children". As with other Rough Guide samplers for children, I would not be able to tell from listening that the songs on this album are childrens' songs so I have to take the word from the booklet for it. It is not a bad sampler of African music (there is some music I really like, other songs are less my cup of tea) - but I would not think that children (and adults) from other cultures would recognise this necessarily as children's music. P.S. As seems to be the rule these days for Rough Guide albums, there is a bonus CD, this time by Italian-Somali singer Saba - quite an enjoyable modern album (with no obvious children's music link). 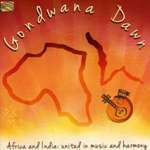 African Children Travelling to India: The album "Gondwana Dawn" is a musical journey of 8 children from schools in South Africa and India to embark on a collaborative music project. Led by producer Robin Hogarth and Indian musician Vidushi Smitra Guha, the result is an Afro-Indian world fusion project - with the African children being exposed to classical Indian music that they did not know beforehand. An album that celebrates cultural differences and similarities - and an exploration of a new culture. Again, as with the album above, not necessarily a specific album for children - but it still seems to fit into this column! Visiting Clams... Off to another continent - to New York - where we go and visit the Happy Clams led by Lena Pennino-Smith. 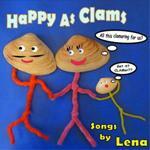 "Happy as Clams" is a short CD (26 minutes) of 13 songs aimed at pre-school children. The songs are all written by Lena, and feature a fiddler crab, pirates, lady bugs and of course happy clams. And finally - Cherry Tree Days... This is a CD about the kind of summer days we all like to remember of our childhood (even if we never had them!). The album is based on poems by Robert Louis Stevenson told from the perspective of a child, which have been put to music with added refrains and translated into German! 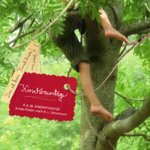 "Cherry Tree Days - Kirschbaumtage" features these musical adaptations of poems in both German and English language - and the result is a very positive and charming album with great music, refrains and lyrics - talking about childhood days looking down from cherry trees, swinging high and going to the seaside to dig holes in the sand. Certainly recommendable also for the English speaking market! Photo Credits: (1)-(5) CD Covers (from website).